Happy Spring! Although the new season has been slow to arrive in Ithaca (and much of the US), students return this week from Spring Break with only five weeks of classes left. Do you remember sprinting to Finals Week when you were at Cornell?!? Looking ahead to warmer weather, we are organizing a class dinner at Reunion THIS YEAR, on Saturday June 9 in Ithaca, at the home of classmates Kristen Rupert and John Foote. Yes, our 45th Reunion is still one year away. However, our Reunion co-chairs will be in Ithaca this June scoping out dinner venues, caterers and activities. Local classmates and class officers will also be there. Please join us! Any alum may attend Cornell Reunion: you can register as a non-reunion year (NRY) alum, attend events, and stay in on-campus housing. Details are here. The link to register for the class dinner on Saturday is not available yet. But, if you are interested in attending or have questions, contact Shelley Cosgrove DeFord at scdeford@gmail.com. This summer also offers an opportunity to take one-week classes on campus through Cornell Adult University (CAU.) You and family/friends can choose among cycling, wines, astronomy, literature, politics, hip-hop, golf, gorges, yoga and more. CAU classes run from July 8-August 4 and accommodations are on campus. Click here for more information. You recently received a letter encouraging you to pay your class dues for 2018-19. Dues help pay for class communications, events, reunions and more. As a dues-payer your receive Cornell Alumni Magazine as well as discounts on some Cornell services. Our class has held the line on dues amounts again this year–classmates pay only $60 or $30 with no magazine. And if you pay by April 13, you’ll receive $150 off the coast of a CAU course. If you are on dues auto-renewal, your credit card will be charged in July. To pay dues by check, visit our class website here. To pay dues on-line, click here. Hope to see you at Cornell Reunion in June or another Cornell event soon. Since my daughter graduated from Cornell last year, I miss the frequent Ithaca visits to see the beautiful views and enjoy the memories they evoke. I am so thankful to be a part of the [Notable] Class of ’74. I met such amazing people during our years on the hill and through our reunions have made more friends with classmates who never crossed my path in the ‘70s. That’s what makes our class dues so important. 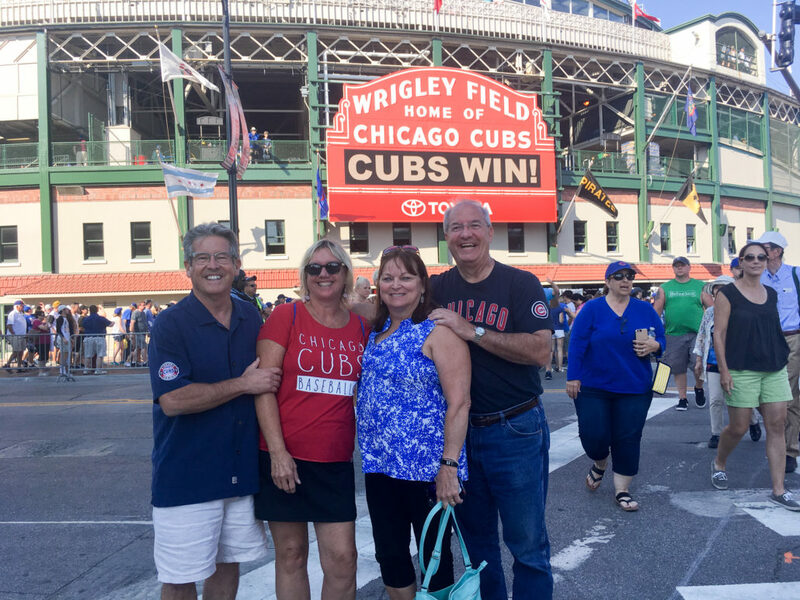 They support our class initiatives providing opportunities to get classmates together at events like reunions, Homecoming tailgates, receptions, and other functions around the country. They make class communication—class website and monthly emails—possible, keeping us up to date with each other, the Cornell campus, and upcoming events. They provide the funds for our photo gallery and our greatest perk, reduced-price subscriptions to the award-winning Cornell Alumni Magazine. You may also sign up for Auto-Renewal and Cornell will charge your credit card on July 1 each year. To pay by check, please fill out the dues card enclosed in your recent mailing and send your dues check to Cornell University, Box 37333, Boone, IA 50037-0333. Also consider a donation to our class scholarship, which makes it possible for a current student to afford the Cornell experience. You may also pay dues on-line here. Plan to attend reunion in June 2019. I look forward to renewing friendships and building new ones! Send us suggestions for class activities throughout the year and for reunion. Hope to see you in June 2019 if not before! Hope your new year is off to a good start. 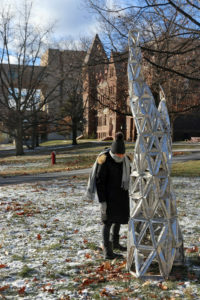 Students are back at Cornell after winter break and spring semester classes began last week. A snowy December has given way to a relatively snow-free Ithaca in late January. We thought you might enjoy an update from our CU ‘74 Scholarship recipient Wendi Gonzalez of North Carolina, Class of 2020 in Art, Architecture & Planning. Many classmates have donated money to this scholarship over the past 20 years. We–and Wendi—thank you for that support. Her note is below. A couple of additional items…. We are co-hosting a Classes of the 70’s Party in Philadelphia on Friday, Feb. 2 at 7:45pm. Learn more here. We are beginning to plan our 45th Reunion, June 6-9, 2019. We’re reaching out for ideas on how to make this reunion the best ever for our Notable Class. Please send ideas or suggestions to Shelley Cosgrove DeFord, Reunion Co-Chair, at scdeford@gmail.com. My second Fall semester was just as amazing as the other two, if not better because now I feel like I know what I am doing. I started off receiving the toughest professor for our studio class (I promise I am not exaggerating). In fact, by the end of the first month my entire class agreed that she was the hardest to please. However, the work our section produced was incredible. I am happy to say that my other classes went great as well. I was taking Building Technologies, which helps me become a ‘safer’ architect, which follows regulations and code. In my Structural Systems class I learned how to make my building stand (although there is always going to be an engineer to help us). I learned how to analyze buildings and integrate this into my own design in Analysis. And last, but not least my team and I built a 9-foot column for our Special Topic: Forms of Making class. I really enjoyed my third semester at Cornell! I cannot believe time went by so fast, but I plan to make the best of it! Hope to see you at a Cornell or class event in 2018! It’s been a busy fall for classes of the ’70s events. 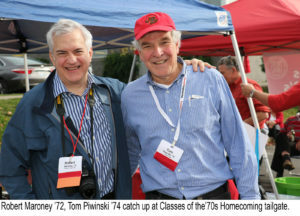 At Cornell Homecoming 2017, the annual Class of 1974 tailgate was expanded to include other Classes of the ’70s (plus ’69) and drew well over 100 participants, including 20 plus from ’74. Classmate Roberta Bandel Walcer spearheaded a group of volunteers who set up tent canopies and arranged food. The weekend was fabulously warm and sunny for so late in the season, and Friday night fireworks and music thrilled a full Schoellkopf Field crowd. 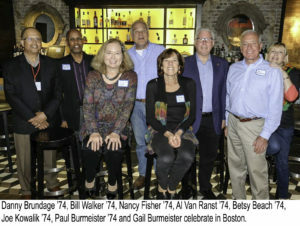 In late October, about a dozen classmates met in Boston for the final 65th birthday celebration for our class. Classmate Nancy Maczulak Fisher organized cake and balloons at the late afternoon reception. On Thanksgiving weekend, the ’70s classes organized the annual Cornell men’s ice hockey pre-game party near Madison Square Garden in NYC. Classmates attending the game saw a thrilling win by Cornell, 4-3, over a Boston University team that surged in the final five minutes. Looking ahead, the classes of the ’70s will host a reception in Philadelphia the weekend of February 2-3 during Cornell’s annual Alumni Leadership Conference. We’ll share details once they are available. Hope your fall is off to a promising start. The still-Notable Class of 1974 is organizing two October events—one in Ithaca, one in Boston. Cornell Homecoming, ’70s tailgate, Brown football. Our class and others from the ’70s (also ’69) will host a tailgate Saturday, Oct. 21, near Friedman Wrestling Center from noon to the 3pm kickoff of the Brown football game. All free: sandwiches, Cornell apples, beverages. To register for the tailgate (also see who’s coming), click here. Homecoming weekend features a fine arts tour on campus (highly recommended), a faculty lecture on The Hidden Value of Detective Fiction by English Prof. Caroline Levine, a virtual or in-person 5k (run it anywhere), and a fan festival with music and rides. Most events are Saturday. A laser light show and fireworks is Friday 7 pm. To register for Homecoming (separate registration from tailgate), click here. Our Final 65th Birthday Party, in Boston. Sunday, Oct. 29, 5-7:30pm, classmate Nancy Maczulak Fisher is arranging a ’74 reception at Brass Union in Somerville, 70 Union Square, for classmates and friends. Hors d’oeuvres, birthday cake and balloons are free; drinks are not (sorry). Come celebrate our 65th year in style! No RSVP required. Questions? Email Nancy at fishernancy5@aol.com. In other very big news, the Cornell Tech Campus opened in NYC to much fanfare Sept. 12. Dignitaries, alumni, staff and students celebrated the completion of three key buildings—the Bloomberg Education Center, the Bridge (for collaborative initiatives), and the Residence—and the move of 300 graduate students and 30 faculty from temporary quarters at the Google building in lower Manhattan to Roosevelt Island. Cornell Tech is a partnership with Israel’s powerhouse Technion Institute of Technology (four Nobel prizes since 2004) to create the tech-focused grad school designed to attract and host start-ups, graduate students, researchers and industry. Read more about this transformational program in The New York Times here. Check it out for yourself: Take the 59th Street tramway or subway (F train) over to Roosevelt Island. Enjoy this fall season. I look forward to seeing you at a Cornell event soon. 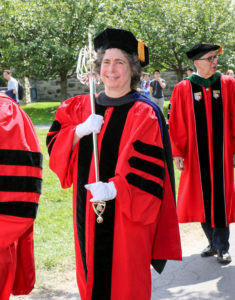 At the inauguration of new Cornell president Martha Pollack in Ithaca—a glorious occasion on a picture perfect day– our classmate and Cornell faculty trustee Mariana Wolfner (Professor of Molecular Biology and Genetics) carried the official Cornell Mace in the inaugural procession. Very Notable! In case you are wondering, “The Mace symbolizes the authority of the university…was designed by the Goldsmiths’ Guild of London in 1962…and consists of a tapered silver shaft surmounted by a golden terrestrial globe. The silver ribs surrounding the globe symbolize the universality of Cornell’s interests and the worldwide affiliations of its faculty, students, staff, and alumni.” A tiny Cornell bear holding a rowing oar sits atop the Mace. President Pollack, in her thoughtful inaugural address, quoted Cornell historian Carl Becker and talked of the need for Cornell to aspire to have “educational verve,” meaning “a vitality that leads our students to a lifetime of discovery, a passion for ideas and a commitment to seeking truth.” Martha also talked about the role of civic responsibility and the value of free speech. To read more about Martha’s remarks and the inauguration, click here. We are impressed with Martha already–she is warm, smart, down-to-earth, practical, a good listener, and leading Cornell, after just five months, with a deft touch. Classmate and photographer Bill Howard took some terrific photos on Inauguration Day. You can see classmates, ice cream (Martha’s Bits & Bytes—a special Cornell Dairy concoction of banana custard cream with chocolate chunks,) the mace and more at our class photo website. With the start of a new academic year, our class is organizing two events for the fall. In Ithaca, on Saturday, October 21 during Homecoming weekend, we are joining with classes from 1969-1979 to do a joint tailgate before the 3pm football game. More details will be shared soon. Boston-area classmates should save the date of Sunday October 29 in the late afternoon when a Class of ’74 cocktail reception is planned. Details to come. Hope you have had a great summer. Enjoy the long holiday weekend. SMILE FOR THE CAMERA! The Notable Class of 1974 is compiling photos of all of us celebrating our 65th birthday year. So please take a photo of anything you believe describes you and what you’re doing midway through your sixties: you and spouse/partner on a trip, you with your pet, you with friends or family, engaging in a hobby, doing charitable work, whatever. Send the photo and a brief description to Bill Howard at bill@billhoward.com so he can add the pics to the Class photo site. Check out already-posted photos here. Password: notable. Martha Pollack, Cornell’s 14th President, will be officially installed in a ceremony on the Arts Quad Friday, August 25 at 2pm. All are welcome. Other inauguration-related activities open to the public include a Thursday Aug. 24 Festival of Scholarship at 4:30pm and an Academic Symposium on “Universities and the Search for Truth” at 6:30pm. On Friday there’s a street fair on the Arts Quad immediately after the installation ceremony. For further information click here. Our class is organizing an informal Inauguration Weekend breakfast. Ithaca ’74s, Mary Berens and Roberta Bandel Walcer, hope classmates will join them on Friday morning, August 25 from 9:30-11am at Collegetown Bagels at East Hill Plaza. Address is 329 Pine Tree Road. Class of ’74 grocery bags will be given to all attendees—so you can take a dozen bagels home! No need to RSVP, though if you have questions, contact Roberta at rbwalcer@aol.com. Finally, classmates Mary Berens, Kristen Rupert and John Foote are once again hosting a picnic on Cornell move-in day, Friday August 18, for new students, parents and friends of the Notable Class of 1974. It looks like we have our first-ever Cornell ’74 grandchild enrolling at the University this fall. Woohoo! And we have at least two classmates with sons or daughters starting as freshmen or transfers. If you know of other legacies related to the Class of ’74 who are coming to Cornell next month, please let us know so we can invite them to the picnic. Enjoy the rest of your summer! 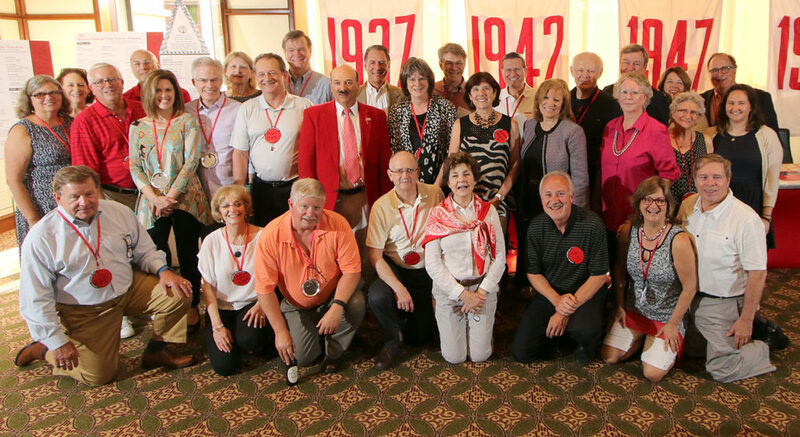 We had a great 65th Birthday Reunion celebration in Ithaca earlier this month, with more than 50 classmates and guests attending class dinners over a spectacular weekend. We came from as far away as Texas, California, Colorado and Michigan—and as close as Ithaca. Special thanks to classmates Bob Baldini, who made all the final arrangements and ensured everything ran smoothly, and Perry Jacobs, who conceived of and promoted th Birthday Reunion. Take a peek at the class photo below, from class VP Bill Howard, and plan now to attend our 45thReunion June 9-12, 2019! Reunion weekend 2017 featured a number of highlights including a talk by Bill Nye ’77—The Science Guy—back for his own Reunion. The sold-out crowd in Bailey Hall heard an entertaining and enlightening presentation by Nye on “How Cornellians Will Save the World.” Nye shared his experiences at Cornell as a mechanical engineering student, his early work at Boeing, and his relationship with Carl Sagan, who inspired Nye to become a science educator. Watch Bill Nye’s Cornell talk on video here. New Cornell President Martha Pollack shared her insights on her first seven weeks on campus in a one-on-one Reunion interview on the Bailey Hall stage. President Pollack talked about why she decided to interview for the Cornell president’s job, how a professor at her undergraduate college (Dartmouth!) changed the course of her life, why free speech is critical on today’s college campuses, and how her husband and four cats are adjusting to life in Ithaca. Check out Martha’s interview here. In her Cornell Commencement address last month, Martha Pollack talked about a Notable Class of ’74 member named Daniel Fried. Daniel recently retired from a forty-year diplomatic career with the US Foreign Service after serving as US Ambassador to Poland and Special Assistant to Presidents Clinton and George W. Bush, with a focus on Eastern Europe. Martha directed our grads to consider Daniel’s retirement speech in which he said, “I learned never to underestimate the possibility of change, that values have power, and that time and patience can pay off.” For the full text of Ambassador Fried’s remarks, click here. Finally, looking for some intellectual stimulation this summer in one of the most beautiful places in the world? Consider returning to campus to take a Cornell Adult University course. Week-long classes are offered in July. Choose among classes in history, politics, wines, kayaking, golf, archaeology, cooking, hip hop and more. Visit the CAU website. 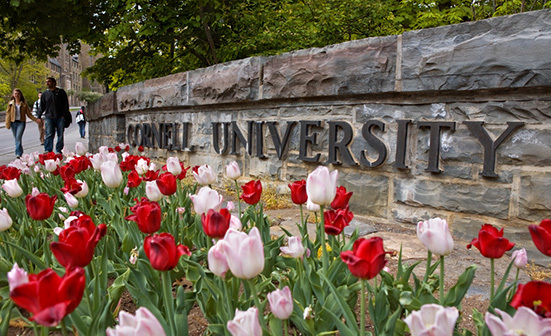 We hope you will celebrate with us at our 65th birthday party over Cornell Reunion June 8-11. Deadline to register is May 31 and details are at the end of this email. Commencement takes place Sunday in Schoellkopf Stadium. At President Martha Pollack’s first Cornell Commencement, she will give the traditional presidential address that has been part of Cornell’s graduation ceremony for decades. 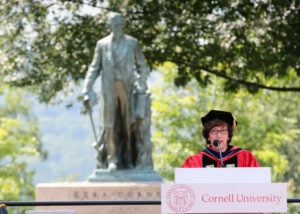 The Cornell president is the only keynote speaker at Graduation. No famous folks giving the Commencement address—our president does that. This means the focus is on Cornell students and the event is brief. No one complains! Typically, each undergraduate college holds its own separate ceremony shortly after the larger university event. Cornell does not, however, lack star power on Commencement weekend. Former U.S. Vice President Joe Biden will be Cornell’s Convocation speaker on Saturday. Past Convocation speakers include James Franco, Rudy Giuliani, Nancy Pelosi, Gabby Giffords and Mark Kelly, Cory Booker, Michael Bloomberg, Ed Helms (Andy Bernard on “The Office”), Soledad O’Brien, Bill Clinton, Maya Angelou and Janet Reno. The Convocation speaker is chosen by a committee of undergraduate students. 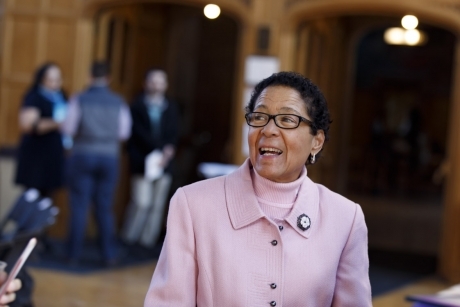 Speaking of students, this spring a program at Cornell called Breaking Bread, led by classmate Renee Alexander ‘74, received the James A. Perkins Prize for Interracial and Intercultural Peace and Harmony. Breaking Bread brings together various members of the Cornell community for dialogue over dinner; recent groups have included Cornell Democrats and Republicans, trustees and students, and fraternities and sororities, often around matters where there are differing opinions. At a recent Breaking Bread dinner, a small group of Muslim, Jewish and Christian undergraduates talked about current challenges on campus regarding different religions and cultures. In a microcosm of what’s happening nationally, students expressed concern about the polarization of attitudes while also conveying hope and identifying steps they’ve taken to keep communications open. The students talked about the need for better education, the importance of keeping an open mind, and the willingness to learn and perhaps change your opinion. To learn more about Breaking Bread and Renee’s work, click here. Finally, please join us at our 65th birthday party in Ithaca June 8-11. We’re holding two class dinners and classmates can stay in Cornell housing in Collegetown. For details and to register click here. Contact Bob Baldini at bbaldini34@gmail.com with questions. It’s a busy spring at Cornell. Our 14th president, Martha Pollack, began her new job in Day Hall April 17. 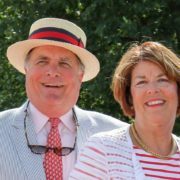 Hunter Rawlings, interim president for the past ten months, is returning to the Washington DC area to enjoy a delayed and well-deserved retirement. 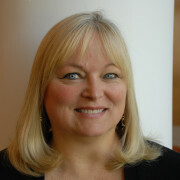 Our new president, Martha Pollack, was most recently provost at University of Michigan. At Cornell, she is a professor of computer science, information science, and linguistics. Read more here about Martha and her initial impressions of Cornell. June is party time for our class! We have planned a terrific 65th birthday party reunion which will take place at Cornell’s Reunion weekend in Ithaca June 8-11. For all of us who love our 5-year reunions but wish we could see classmates more often, this will be a great opportunity for a fun get-together. And it’s the first time our class has held a non-Reunion year Reunion. Classmates near and far have already committed to attending the 65th birthday reunion. Questions about the reunion should be directed to Bob Baldini at bbaldini34@gmail.com. To register for the weekend click here. Finally, this is the time of year to vote for Cornell Alumni Trustees. Did you know that 8 of the 64-member Cornell Board of Trustees are alumni-elected? Your vote matters, so please take a few minutes to read about the six candidates and vote here by May 1. Hope to see you at the 65th birthday reunion in June. Happy Spring! Contribute to the University mission. Our 45th Reunion is just 2 months away!